In a medium saucepan with a tight-fitting lid, combine the quinoa with 1¾ cups water and the salt. Bring to a boil, lower the heat to a simmer, cover, and continue to cook for 10 minutes, stirring occasionally. Once cooked, fluff the quinoa and transfer it to a bowl to cool to just above room temperature. In a separate, small bowl, whisk together the mustard, lemon juice and zest, honey, and olive oil. 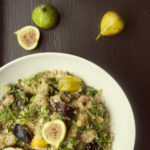 Pour the lemon dressing over the cooled quinoa and add the figs, green onions, mint, parsley, chervil, tarragon, and dill. Toss and serve.